I don’t know if you’ve seen these …. I took one home recently because Lucas has chewed his wicker basket in less than 2 weeks and I thought the design was really cool for a doghouse. What I didn’t know was how easy this thing was to put together. 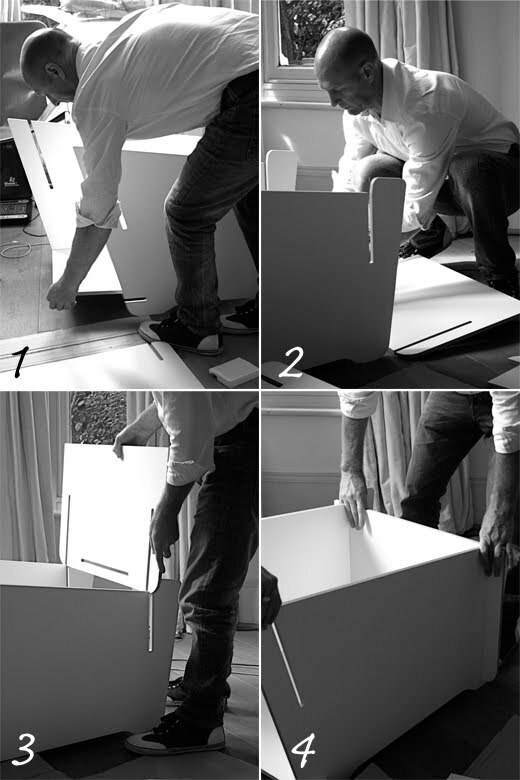 The Fuora doghouse comes flat pack and I have to admit that for me ‘flat-packed’ meant ‘flat-packed a la Ikea‘…i.e. stressful but it wasn’t! It is created from a clever slot system in which 6 wooden panels slide together and Steve and Mila put it together in less than 8 min (including unpacking and disposing of the cardboard boxes). The other good thing about the Fuora Dog house is that it is made with multi-layered birch wood from a programme for the Endorsement of Forest Certification (PEFC) sustainable source so not only the Fuora Dog house is well-designed but it is also eco-friendly. The final result is a super stylish, yet practical dog house which requires no maintenance at all and it is easy to clean….Now having this super cool, modern white doghouse made our outdoor space looking like…well it needed some serious TLC but that Steve’s job. He has already started taking off the ugly 70’s looking concrete slates and by next Spring, we should have a neat, contemporary kiwi deck with a bit of grass.